Even if the early spring has just began to come out, the new collections from our favourite brands have already made us feel like summer is in the air. So what will the upcoming summer be like? Colourful, full of flowers and love!. Clothes and accessories available at Miss Lemon-ade offer the unforgettable mix of design, patterns and prints. The 90’s fashion trends are back and with them the colourful jeans and cotton crop tops are in the game. We are discover-ing boho style anew - romantic, flowy dresses and flower patterns looking and feeling like meadows. Must-haves in our summer suitcase are definitely never going out of fashion straw hats and nautical overalls. 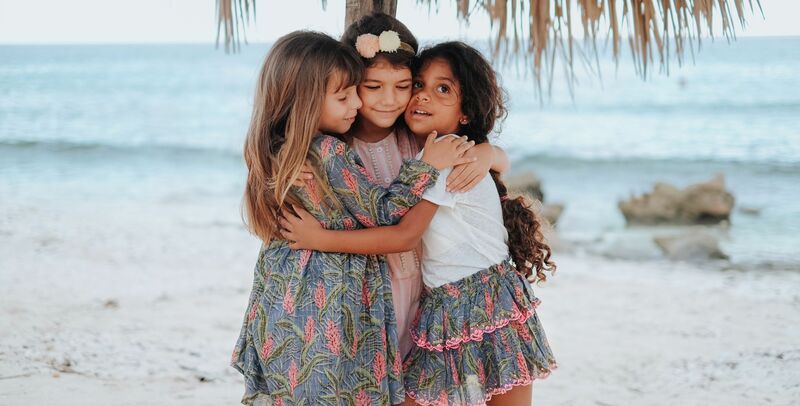 Look what charmed us in the spring-summer 2019 children fashion trends’ collections. Mother Earth is becoming the never ending source of inspiration once again. Brown, yellow, green and ivory are the most trendy colours of this season. New proposals coming from the iconic brands give us the colours of golden sand, forest, natural wood and silvery, little stones. The designers are definitely coming back to nature and they want our kids to be as close as possible to it so that they can enjoy its beauty and respect its indefinite mysterious essence. Nowadays we live in the crowded, full of noise and clamant billboards’ cities, that can make everything look sad and grey. Delicate colours of the earth give us the feeling of freedom from everyday turmoil. They bring us the sense of limitless sky, wild greenery and breathtak-ing, majestic mountain ranges. You can wrap yourself up in the natural fabrics: noble linen, organic cotton and lightweight viscose. If you need to be close to nature, choose Poudre Or-ganic clothes. Muslin blouses, jumpsuits, dresses and trousers are must-haves for every fash-ionista boy and girl. New look inspired by nature can be spiced up with the Rylee and Cru summer proposals. Details such as cute frills and english laces are the newest trends in kids’ fashion. For some they can be classic clothing cliches, but for us they are the essence of the summer fashion. Thanks to the flowers we can play with trends and create romantic, cheerful outfits. Once again flower patterns play the main role in the upcoming spring-summer season. Some of them will take us to the sunny grasslands full of wild flowers. With others we will find our-selves around roses blooming in the old square. The simplicity of some other ones will make us see the handmade image full of painted daises. Colourful, minimalistic, flamboyant and tiny - they can be so diverse but the beauty is in all of them, like in our children. Flowers will make every little girl feel like a real, little woman. This timeless pattern will em-phasise the girly charm and add a unique style to the summer look. Vintage design is the source of inspiration for the brands available at Miss Lemonade. Ideas for the flower prints can be found anywhere - from looking at old vintage photos to watching old, elegant dresses from the grandmothers’ closets. Thanks to that we can celebrate and admire the forgotten patterns of pansies, oxeye daisies and grand gillyflowers. Flower patterns are on almost every part of children’s fashion - from blouses and dresses to swimsuits, bags and hair clips. Exotic flowers inspired by the cuban greenery play a huge role in Louise Misha brand collection. You can find hand embroidered flowers full of juicy colours on dresses, blouses and warm sweat-shirts. Team from Bonton brand, on the other hand, put patterns from “grandmas closet” on the first place. Here the roses bedding patterns are blooming in the company of daisies known from curtains. This one comes straight from the world renowned fashion shows. Fruit prints settled down for good in kids fashion referring to the iconic Dolce & Gabbana duet’ style. Ruby strawberries, sour lemons and sunny oranges are the most used patters. Apart from those, there is also a space for the ripe cherries, juicy pears and yellow bananas. Everyone can find something deli-cious for themselves!. Mini Rodini is the absolute leader in this category. One of the brand’s proposal is the banana print in the sunglasses. Its notched smile and bold statements is what will bring smile on both children and adults’ faces. Little fashionista girl can choose fruity sweater from Bonton. Cream cotton is decorated with strawberries, pineapples, melons, sweet cherries and oranges. This fruity cocktail will make your little fashionista girl look trendy and what is more - feel amazing. The outfit won’t be complete without the right accessories. Fortunately our favourite brands stepped up to the challenge!. Glamorous émile et Ida bag with wooden bag handles was made out of natural burlap. Nobody will walk by embroidered, red apples without look-ing! For the youngest kids we recommend cute dungaree from Bobo Choses. Pink, organic cotton with the drawn apples print will make your little one look adorable. Rural landscapes, rustic house and ducks walking on the yard is the foreground. In the up-coming season we are being relocated again to the rustic countryside to spend time completely carefree. Time goes by slowly, in its own pace - we take walks to the river to watch the frogs and we make hair wreaths from the wild flowers. All in the company of romantic dresses, linen shirts and straw hats. The well known themes from our childhood are once again trans-ferred to clothes and accessories. Return to nature, apart from subdued earthy colors, happens as well through discovering the beauty in the simple living and enjoying small things. It is a praise to nature, family vibe and love. Bobo Choses proposals fit perfectly into the rustic vibe. Green dress with the embroidered sweet cherries, bebe collar and frills is the new way of re-looking at kids’ fashion classics. Cute print with the majestic little gooses is a praise towards folk dresses and cut-outs. Rustic tale is also emphasized by never going out of fashion vichy check pattern. It is on almost eve-ry part of the SS’19 kid’s clothing: you can find it on the skirts, shorts, overalls, T-shirts and many others. Dress from Babe&Tess is without a doubt one of the most beautiful proposals. Delicate, white and blue check pattern will look stunning during the family picnic or when going to the lake. Loose cut and fringes on the shoulders will make every little fashionista girl fall in love with the dress. Nautical style has been the trend associated with the summer fashion for many years. Going on a long cruise, splashing waves and flying seagulls are the moments being caught on this exceptional postcard. It is here that the wind blows the hair strands and the sunrays play on the freckled little nose. It is here that we are building the sandcastles wearing the nautical overalls. It is also here that we are swimming in the warm sea and looking for the golden am-bers. Thanks to the nautical clothes we can feel the sea breeze in the heart of the city. Nautical jacket from Mini Rodini is definitely a must-have for the little pirate boy. Old sailor style clothes will bring out the imagination and will make our kids have so much fun with the treasure hunt games. Plentiful collar with stripes and funny print on the sleeve will make your little boy feel like a real sailor! You can match the jacket with the stripe cotton pullover put under. For the little mermaids the two-piece swimsuit with the frill from Caramel brand is a must have, especially for the first swims in the sea. Let the adventure begin!. Wicker basket bag is the summer fashion classic. This season we are going even further deco-rating our bags with colourful flowers embroidery and compelling slogans. Bonton is the brand that meets all of the trends in kids fashion. Round plaited bag will have space for all of the must-have items of your little beach girl. Retro style slogan “Dolve Vita” can mean only one thing - wonderful, sunny holidays! For the older girls or their mums straw basket bag with embroidered hearts is highly recommended. Two types of the handle will provide comfort in every situation - on the beach and when enjoying your favourite ice-cream. If your little fashionista girl prefers the french style, choose the bag from Les Coyotes de Par-is. Burlap bag wit the slogan and ornate tassel will be a perfect match for every summer look. For the fans of urban classic style tote model is highly recommended. In the spacious bag with the wide stripe you can fit everything you need - summer books, sunscreens and a straw hat. Taking the one from Bonton as an example - with the colourful beads - it will not only protect you from the sun rays, but will be an original accessory to your stunning summer look. Do not let boredom win during the summer time! Choose prints, which will make your kids’ summer outfit look amazingly fresh and lively. One of the most interesting trends for the new season are prints and slogans. Mini Rodini is the leader in that, without a doubt. The newest Mini Rodini collection is inspired by the exotic lands and wild animals. Mini skirts and leg-gings are decorated with bored monkeys, just waiting for the summer adventures to begin. If you choose trousers, match it with the blouse showing monkey dancing to la isla bonita sum-mer song. Mustard dress with the green crocodiles will be a perfect choice for the girls that like to be seen in the crowd. Baseball cap that has a hilarious print on it - banana drinking cocktail with the palm tree stirrer - will be an ideal final touch for your little one.